* BLEED: Your artboard should be .25" larger than the sticker size you are ordering to account for a bleed. For example, if you are ordering a 4" x4" sticker, you should have an artboard of 4.25" x 4.25". The reason we need a bleed is so we can cut your stickers without a risk of having a thin white area on any side of the final stickers. 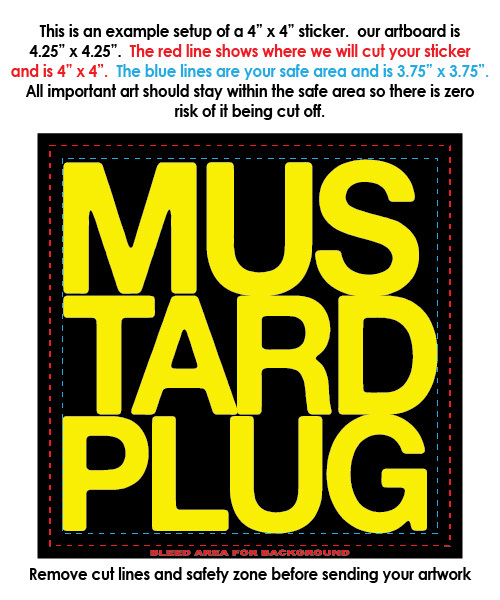 *SAFE ZONE: Keep all important logos and text .25" away from the cut line. Let's use the example of a 4" x 4" sticker again. You want to keep all logos and text inside a 3.75" x 3.75" safe area. Only the background should extend to the 4.25" x 4.25" art area. The reason we need a safe area is so we can cut your stickers without a risk of having important artwork cut off on any side of the final stickers.